The last of the three IPCC 5th Assessment Reports has now been published, but with a final Synthesis Report to come towards the end of the year. The “Mitigation of Climate Change” details the various emission pathways that are open to us, the technologies required to move along them and most importantly, some feeling for the relative costs of doing so. The cheapest and least risky route to dealing with global warming is to abandon all dirty fossil fuels in coming decades, the report found. Gas – including that from the global fracking boom – could be important during the transition, but only if it replaced coal burning. A long-awaited UN report on how to curb climate change says the world must rapidly move away from carbon-intensive fuels. There must be a “massive shift” to renewable energy, says the study released in Berlin. While it is a given that emissions must fall and for resolution of the climate issue at some level, anthropogenic emissions should be returned to the near net zero state that has prevailed for all of human history barring the last 300 or so years, nowhere in the Summary Report do words such as “abandon” and “dirty” actually appear. Rather, a carefully constructed economic and risk based argument is presented and it isn’t even until page 18 of 33 that the tradeoff between various technologies is actually explored. Up until that point there is quite a deep discussion on pathways, emission levels, scenarios and temperature ranges. Particularly for the lower concentration scenario (430-480 ppm) the table highlights the importance of carbon capture and storage. For the “No CCS” mitigation pathway, i.e. 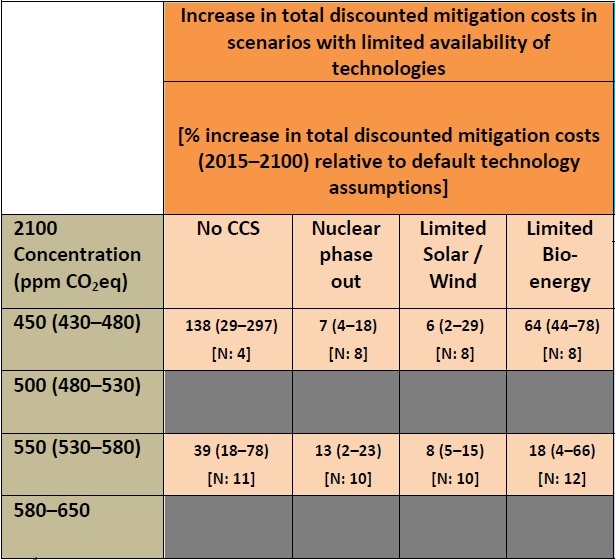 a pathway in which CCS isn’t available as a mitigation option, the costs are significantly higher than the base case which has a full range of technologies available. This is still true for higher end concentrations, but not to the same extent. This underpins the argument that the energy system will take decades to see significant change and that therefore, in the interim at least, CCS becomes a key technology for delivering something that approaches the 2°C goal. For the higher concentration outcomes, immediate mitigation action is not so pressing and therefore the energy system has more time to evolve to much lower emissions without CCS – but of course with the consequence of elevated global temperatures. A similar story is seen in the Shell New Lens Scenarios. Subtleties such as this were lost in the short media frenzy following the publication of the report and only appear later as people actually sit down and read the document. By then it is difficult for these stories to surface and the initial sound bites make their way into the long list of urban myths we must then deal with on the issue of climate change. There is a lot of uncertainty around CCS which suggests that, although it may eventually be proven safe, we cannot hold our breath waiting … CO2 reductions need to begin quicker than CCS can be brought online. I have not digested the entire WG3 (let alone WG1 or WG2), but believe that immediate reduction in hydrocarbons would give effective CO2 reductions while creating a ‘de facto’ carbon fee which accounts for externalized costs. If you can demonstrate to me that coal-based CCS is financially viable all-externalities-in, I’ll give you my bridge in Brooklyn for free. That includes the full-on costs related to mining, transporting and burning the coal as well as compressing, transporting, burying, and long-term managing the stored CO2. Since a CCS plant is going to use a non-trivial portion of its generated power to compress and pump the CO2, it’s going to have to burn notably MORE coal in order to have the same net energy output. That means all of your externalities related to mining and burning get multiplied by at least the same factor, unless you install even better (and more expensive) equipment to mitigate these problems. All I see are a ton of costs. I dog dare you to show you can do this right and do this cheap. Of course, if you use the CO2 to extract more oil and gas, you’ve just taken about four steps back and far more than negated your one step forward.